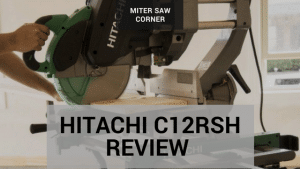 →Hitachi C12RSH Review – The miter saw you have been looking for? The newer version of this saw has already been unleashed on the world, but every carpenter, contractor and wood worker in the market for a new saw is still searching for the Hitachi C12RSH Sliding Compound Miter Saw, despite being discontinued by the manufacturer. This belt driven saw has a whole set of features; the miter is adjustable in 0 to 57 degrees, 46 degrees to the left and 57 degrees to the right. It has a 0 to 45 degrees bevel right and left and it can stop at all the most common angles. It also comes with a five year warranty. Here are a few features that stood out for me and give reason as to why the C12RSH may or may not be the saw for you. Is the laser any good? How is the dust collection? Is this the right 12 inch miter saw for you? The laser is adjustable with a thumb screw, which either sets it to left or right side of the blade. Although a few reviews on social media called this function redundant, it rather depends on the person who works with it. Some also mentioned that a laser on both sides of the blade would be more convenient, but the functionality will rely strongly on the kind of work you do with the laser. Just about every adjustment comes with an extra micro adjustment, to ensure accuracy. The C12RSH has two different sliders and the rails lock to slide in front of the saw or behind, like most other miter saws. Locking it to slide in front works great when you use the saw against a wall or if you have limited space surrounding you work bench, but if you are use to using a saw sliding backwards, it is possible. It is adjustable to twelve inches of slide, with an extra set of wings for stability. It has an adjustable arm that prevents you from cutting right through, you adjust it to your preferred depth, but there are Small inconsistencies in the depth as you can push it and it will cut deeper. Also, when adjusting the depth, it curves the piece you are cutting, as the blade is slightly curved- this is a problem if you are planning on cutting dados. Inside the box, you will find the saw in two easily assembled parts, although there have been complaints about the packaging as it leaves room for scratches and minor damage. This is a good saw to buy, get out and go to work with. The handle is quite awkward, especially if you usually use a saw with a horizontal handle on the side. It is not a huge issue as you will get use to the vertical handle and the height only bothers if your work bench is very high. I have read a few complaints about the amount of dust it creates and struggles to catch, but this is a problem with most saws and is subject to the user. Other users felt it collects dust better than older saws. The weight of the saw is roughly 66 pounds and some users found it heavy and difficult to use when travelling and using it on different work sites. It’s more of a slight inconvenience when you are planning to use it in different areas than it is an issue. As the product has been discontinued to make way for the newer version, the pricing differs from supplier to supplier. It depends on the amount of excess stock they have left and supply and demand. The price is also subject to the condition in which you buy it. Some hardware stores still have stock, but most places have sold out and buyers are reduced to buying the saw reconditioned from Hitachi or second hand from previous owners. Amazon is one of the last places where you can buy the Hitachi C12RSH Sliding Compound Miter Saw new, although they also have limited stock. It makes them one of the first places you should go to find this saw. Their prices are competitive with leading hardware stores such as Lowes, Home Depot, etc. One thing that I really like about Amazon, is that their product page has numerous reviews from handymen to DIY enthusiasts and salted artisans alike who have either bought the product directly from them or have been using it. This is a very adjustable, flexible and affordable saw when compared to other brands with similar models. Whether this saw is right for you will depend on your budget, work space and type of work, as well as other factors such as brand loyalty and individual preference. Be sure to do your homework. Read different reviews, watch a few tutorials on the net and ask your guy at the hardware store, but being over cautious can lead to you missing out as stocks are limited.